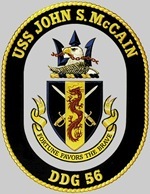 USS John McCain (DDG 56) is tracking a suspicious North Korean vessel Kang Nam I in the Pacific Ocean. Kang Nam I, left a port in North Korea on June 17 and appears to be heading to Singapore. The vessel is suspected to be carrying weaponry, missile parts or nuclear materials. This is in violation of U.N. Resolution 1874, that bans North Korea (DPRK – Democratic People’s Republic of Korea) from exporting weapons, including missile parts and nuclear materials. Past record: In October 2006, the same vessel was detained in Hong Kong for proliferation activities. However, as per the U.N. Resolution 1874, the vessel can not be inspected at sea without the consent of the vessel. Unanimously adopting resolution 1874 (2009) under Chapter VII, the Council sharpened its weapons import-export ban on the Democratic People’s Republic of Korea enacted in resolution 1718 (2006) ‑‑ which included armoured combat vehicles, large calibre artillery systems, attack helicopters, warships and missiles and spare parts ‑‑ by calling on States to inspect, seize and dispose of the items and by denying fuel or supplies to service the vessels carrying them. The Council called on all States to cooperate with those inspections, and, if the flag State did not consent to inspection on the high seas, decided that that State should direct the vessel to proceed to an appropriate and convenient port for the required inspection by the local authorities. Any Member State that undertook an inspection, or seized and disposed of such cargo, was required to promptly submit reports containing the details to the Committee monitoring the sanctions, and to report on any lack of cooperation of a flag State. Read more from, The Fox News. 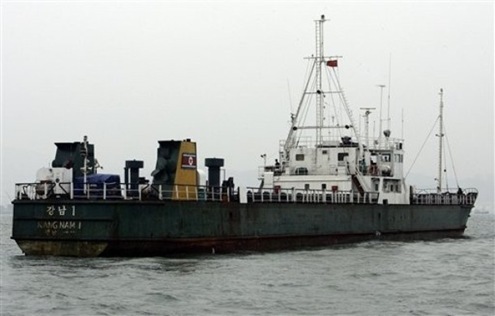 Singapore will take necessary action against Kang Nam I of DPRK, if the vessel heads to its port with cargo of weapons. Read more from Shanghai Daily. The North Korean ship Kang Nam I, suspected to be carrying weapons has turned around and appears to be heading back to North Korea as the vessel was tracked by U.S.Navy. Read more from Hindustan Times.